Crawlspace or basement flooding can occur any time of year. Snow melt and thawing ground water can lead to flooding in the cooler months. Heavy rains can cause problems in the summer. When you walk downstairs and find you’ve had a flood, your first priority will be removing the standing water. However, even when standing water is gone, the problems associated with wet basements and crawlspaces don’t go away. Damp conditions can lead to mold, mildew and even insect infestations. Basements can flood or become damp anytime of year, leading to a wide range of problems. 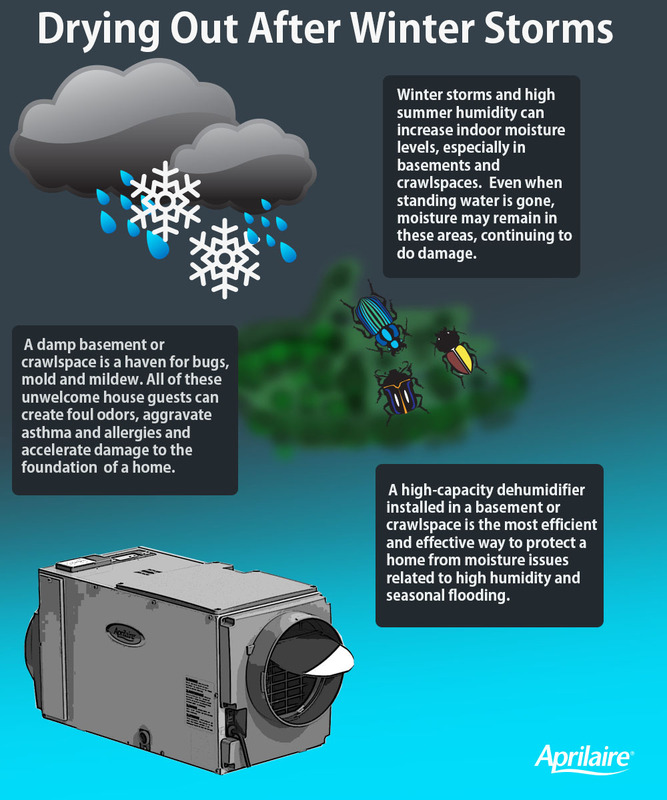 Aprilaire high-capacity dehumidifiers more completely and efficiently fight damp conditions due to flooding in the basement or because of high summer humidity. Visit the Aprilaire website for more indoor air quality solutions and to learn about high capacity dehumidification.